Alibro was founded by Robin Jewsbury who also co-founded Mobizines/Mippin.com as RefreshMobile Ltd and was the technology inventor of these services. He also founded Promoht Ltd which supports Mobile Operators in services. Robin Jewsbury, the founder of Alibro, designed the world's first commercial appstore for T-Mobile in 2001 and as Head of T_mobile international's Innovation group demo-ed something similar to today's Siri in 2004 and created an inapp billing API using in games apps in 2003 - all a bit early but also all a world first. In 2005 he was part of a management buy out team which bought out technology to create mobile magazines for Symbian phones and co-founded RefreshMobile Ltd. This startup was funded by the VC, Accel Partners, went on to create the successful Mobizines product and later created Mippin.com which was used by two major major organisations as whitelabel services (one a major operator the other a major phone manufacturer). During this time Robin also worked with some of the major UK print publishers and for example wrote the Daily Star and OK Magazine apps which are available for download on all major appstores (Daily Star is currently number 11 in the UK iTunes Appstore chart for the News category). 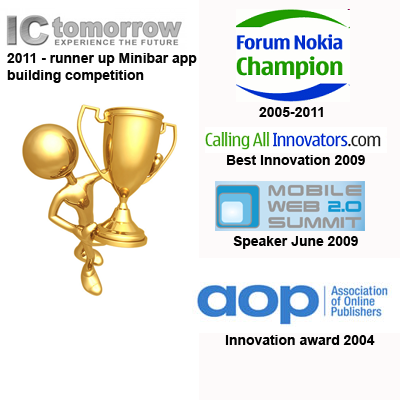 In August 2009, Nokia awarded Robin 1st prize for Internet Innovation for an app called TechBuzzWidget which he wrote for the N97 phone and other Nokia Symbian phones. Robin has been a 'Nokia Champion' for 6 years which puts Robin in a list of the top 120 Nokia developers in the world. In Sept 2009 Robin bought out a product called EyeMags from RefreshMobile Ltd in order to take this product into a wider offering. In 2011 Robin founded Promoht.com which built and delivered a mobile web service which modified the content on an individually personalised basis for each user with content management system which allowed stories to be targetted at users based on location and interests. This service ran for two years in 12 Vodafone countries with 4million uniques users per month and with server availability of >99.95% over the 2 years - which was unmatched for any similar supplier of Vodafone. Earlier in his career Robin worked for Reuters and before that Logica as a consultant and wrote numerous reports and headed up projects for industry and government. Robin is a well known commentator on the Mobile Industry and its trends,see his Latest blogs on LinkedIn. One such trend analysis is Phonecount.com which shows a running count of phone and mobile internet growth in real-time.